We had a lot of houseguests in the Yellow House last weekend. It was a whirlwind of laughter, late nights, and big dinners and breakfasts with everyone gathered around the table. I love having all our friends here, but at the end of the weekend, when you’re left with a pile of dirty plates (or empty champagne bottles, as it may be…) and are faced with the prospect of work the next morning, well…you realize you’re a more than a little tired. All the garden prep is getting me pretty hyped-up for spring—maybe a little overexcited. I went to the farmer’s market, like I do most weekends, but I think I forgot that it’s still mid-March. I’m not sure what I was expecting. But it certainly wasn’t the drab end-of-winter squash, the last stores of winesap apples (which, incidentally, I love and stocked up on, but still), and the ever-present cool weather greens that I encountered. I’m ready for some brighter color. Isn’t it time for pea shoots and tendrils yet? Baby lettuces? Garlic scapes? The ironic thing is that I’m growing my own veggie garden this year, so it should have been obvious that these items wouldn’t be available yet. But oh, am I ready for them. There were some bright spots. I found a bin of tender bok choy, some gorgeous cippolini onions, and showstopper oyster mushrooms. I loaded up, content with inspiration in any form I could find it, and headed home. 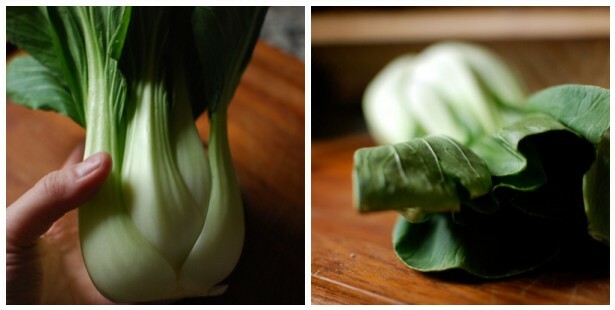 It wasn’t until I got home that I realized I’ve never really cooked with bok choy. There was a time back in high school when my dad decided that he would learn to make Chinese food out of fresh ingredients (an all-day endeavor that culminated in the best General Tso’s chicken you’ve ever had), and we had a quick bok choy sauté on the side. But other than that? “I’m going to do a quick stir-fry with some of the bok choy I bought. Do you want some?” I called out to Chuck. “I’ll have a little,” he said. And it was so easy, guys. So easy that I feel like I shouldn’t even write out a recipe. I should just say, heat some oil, throw in mashed-up garlic and ginger and coarse salt and a teensy bit of red pepper flakes, sauté greens and mushrooms, deglaze with a little mellow vinegar and top with something nice, like a chopped shallot. It’s a run-on-sentence-long recipe. But it was good. It was earthy and tangy and tasted exactly what a farmer’s market meal should taste like—a month or so before the last frost, that is. Makes two small plates, but I imagine it could be two full entrees if you served over rice. Heat olive oil in heavy-bottomed skillet. Macerate garlic and ginger; add to oil and sauté, stirring, for 1-2 minutes. Add bok choy, mushrooms, red pepper flakes, and salt, and stir until bok choy is somewhat wilted and mushrooms have soaked up a bit of the flavor. Deglaze with vinegar and cook a few minutes longer. Taste for salt, and add more if needed. Top with chopped shallots and serve. You are currently reading Not-quite-spring-yet stirfry with bok choy & oyster mushrooms at The Yellow House.